The Volkswagen Tiguan is a compact SUV with powerful performance, a spacious interior, above-average cargo space, and an impressive towing capacity, as well as many standard and available features for customization. Drivers in West Valley, Murray City, and Orem can learn more about what’s included with the 2018 Volkswagen Tiguan trim levels with our in-depth review. All VW trims come with three rows of seats and front-wheel drive, though all-wheel drive is an available upgrade. All-wheel drive trims come with two rows, but the third row is an option. The entry-level S trim includes automatic headlights, power accessories, heated mirrors, a rearview camera, a 6.5-inch touchscreen infotainment system, keyless entry, Apple CarPlay™ and Android Auto™ smartphone integration, MirrorLink®, VW Car-Net® App-Connect, steering-wheel-mounted controls, and cloth upholstery. The S trim can be upgraded with all-wheel drive and the Driver Assistance package, which includes Forward Collision Warning, Rear Cross-Traffic Alert, Blind Spot Monitoring, Pedestrian Detection, and Automatic Emergency Braking. The Volkswagen Digital Cockpit, an 8-inch touchscreen infotainment system, satellite radio, navigation, HD Radio™, and additional USB ports can be added, as well. The SE trim level expands on the standard features with leatherette upholstery, an infotainment system with an 8-inch touchscreen, two USB ports, heated washer nozzles, dual-zone climate control, HD Radio™, satellite radio, the VW Car-Net® Security & Service remote feature, and heated front seats. All the advanced safety features from the Driver Assistance package are also included with the SE. A panoramic sunroof is an available upgrade, as well. 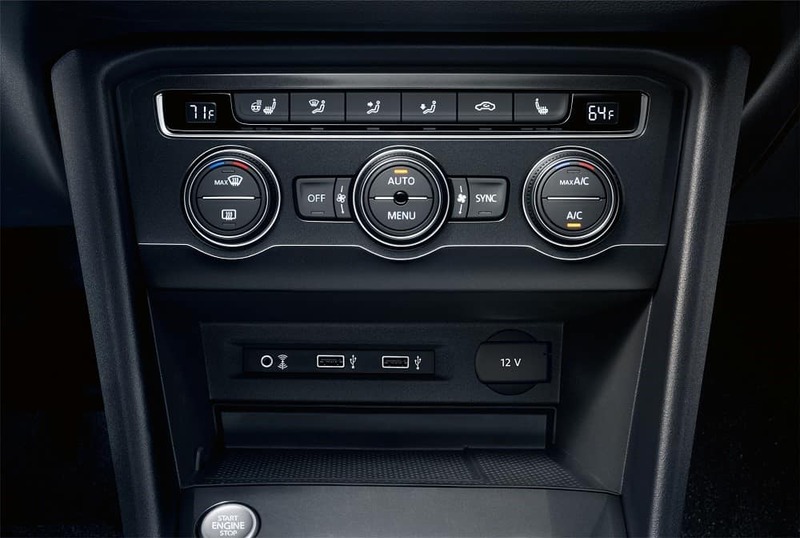 The SEL trim level includes all the features from the lower trim levels, as well as a panoramic sunroof, Adaptive Cruise Control, a power liftgate, and an upgraded infotainment system with navigation, as well as VW Car-Net® Guide & Inform, which displays real-time traffic and weather information. Parking sensors can also be added to the SEL. 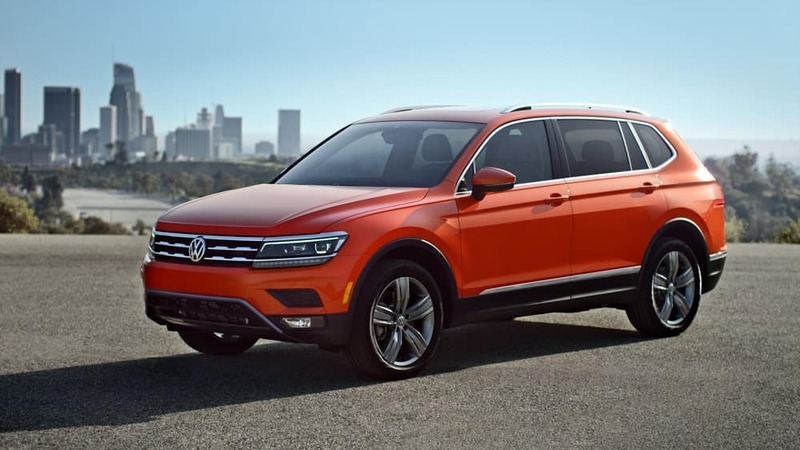 The SEL Premium is the highest VW Tiguan trim level. As the name suggests, the VW Tiguan SEL Premium has all the features you could need as standard equipment: Leather upholstery, a surround-view camera, a digital instrument cluster, a top-down parking system, a hands-free power liftgate, Lane Departure Warning, and a premium 9-speaker Fender® sound system are all included. The R-Line package is available for the SEL and SEL Premium trim levels as well, which includes performance features like larger wheels, sport styling for the exterior, and parking sensors. There’s a long list of features for the 2018 Volkswagen Tiguan trim levels, ensuring that you’ll always have the equipment you want and need. With the exceptional passenger space and cargo capacity as well, the VW Tiguan is a practical choice for an all-around SUV. Drivers in West Valley, Murray City, and Orem can find out more about the standard and available features for the 2018 Volkswagen Tiguan trim levels when they visit Volkswagen SouthTowne. Contact us or stop by our dealership today to get more information and schedule your test drive!